Theobroma cacao is Greek for "food of the gods", we call it CHOCOLATE! The Amazon was the first location that the Theobroma cacao tree was domesticated and it became an integral part of the native society. This simple treat was commonly used as a form of currency in Aztec and Mayan civilizations and was also a ritual beverage. 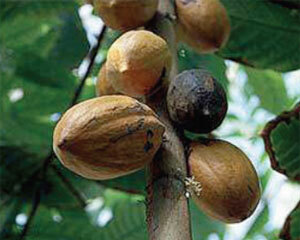 While exploring the Americas, Cortez also found the value of cacao and took it back to Spain. Cacao quickly became known as a drink for the wealthy and soon was seen around the world. The cacao tree is a small evergreen with clusters of pink flowers found on the trunk. While many flowers are pollinated by bees and butterflies the cacao flowers are pollinated tiny flies called midges. The fruit of the tree, a cacao pod, is oval shaped and approximately 15-30 cm (6-12 in) long, 8-10 cm (3-4 in) wide and weighs about 500 g (1 lb). It takes about four months to ripen and the cacao pods turn a yellow-orange color. Each pod contains 20-50 seeds or beans. When the fruit is harvested the pod is broken and the seeds removed. The seeds are fermented for a week in a sweat box which causes the seeds to turn from ivory to brown and gives the cacao bean the characteristic flavor. After fermentation the seeds are dried and shipped to various countries. Cocoa is made from the cacao seed powder after the fat (cocoa butter) is removed, whereas cocoa butter is added to make chocolate. There are various types of chocolate with the three most common being white, milk, and dark chocolate and the others being semisweet, bittersweet, and unsweetened chocolate. White chocolate contains no cocoa and is made primarily from cocoa butter (gives the chocolate the white color), sugar, and milk. In some countries white chocolate is not even called chocolate since it does not contain cocoa solids. Milk chocolate normally contains between 10-20% cocoa solids, this includes cocoa and cocoa butter, and more than 12% milk solids. Dark chocolate, my personal favorite, contains the highest amount of cocoa solids ranging from 35%-100% and has no or very little milk. You can further classify dark chocolate into sweet dark (35-45% cocoa solids), semi-sweet (40-62%), bittersweet (60-85%), and unsweetened (100%). As we all have heard before chocolate is a treat and should only be consumed in moderation. Chocolate is a calorie dense food, meaning there are more calories then nutrients in the food, however, dark chocolate does contain many antioxidants. In order to reap the antioxidant power found in dark chocolate it has to be eaten alone and not with milk chocolate (or any other milk products) since the milk may interfere with absorption. So next time you are craving a piece of chocolate try some dark instead! Now you too can enjoy the sweet beverage that the Mayans once revered. This is a personal favorite after enjoying a hard day of playing in the snow!